Erin Dehmlow, is Impact’s Director of Operations. 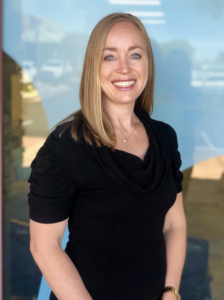 If you see her in the clinics, you may often hear her referred to as “B.” After graduating from University of Arizona, she received her Masters in Career Development from the College of New Rochelle in New York. She has a passion for helping businesses achieve and maintain great success! She enjoys building connections in the community, especially when representing a business as amazing as Impact. As a runner and ice hockey player, Erin has been a long time patient of both Dr. Tamara’s and Dr. Eric’s. She understands the difference Impact Physical Therapy makes in a patient’s experience, recovery and ability to maintain a healthy, active lifestyle and is thrilled to be a part of it!